In today’s competitive world, agile methodologies promise faster delivery, higher quality, increased productivity and better alignment with your company strategy. But while many companies introduce agile approaches at the team level, they often fail when scaling agile to the program and portfolio level. 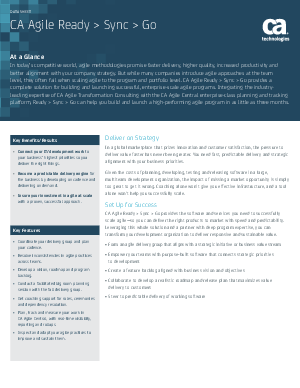 So read this paper to learn how CA Agile Ready > Sync > Go provides a complete solution for building and launching successful, enterprise-scale agile programs. Integrating the industry leading expertise of CA Agile Transformation Consulting with the CA Agile Central enterprise-class planning and tracking platform, Ready > Sync > Go can help you build and launch a high-performing agile program in as little as three months.